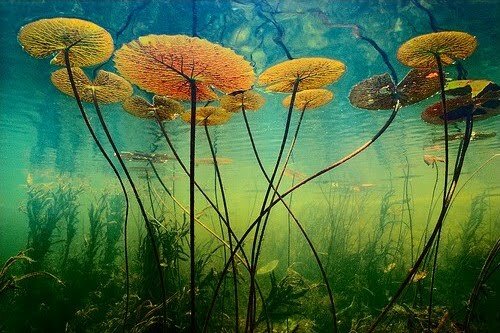 A photo of water lilies in the Okavango Delta in Botswana by Frans Lanting, 1989. Water lilies mottle the surface of the Okavango Delta in Botswana. They represent one of the oldest evolutionary branches of flowering plants. The Okavango Delta is the world's second largest inland wetland region. The delta is maintained by annual pulse flooding of the Okavango River. Oh, how beautiful! Thanks for posting this one. It looks like a stunning art nouveau masterpiece.